Laura Gilmore installed the Chicago version of the "Giant Letter" project Friday. EDGEWATER — The artists behind an annual Christmas project featuring giant-sized outdoor props are back with a new message this year: "Compassion is contagious." 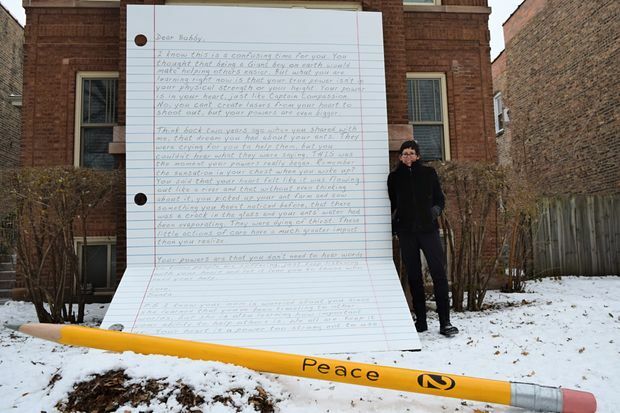 Now in its fifth year, the "Giant Letter" project appears in the 1300 block of Norwood Street in Edgewater — and has received international attention. It was created by residents Laura Gilmore and Caro d'Offay, with help for the 2016 installation from Marj Wormald, as a way to process the horrific shooting at Sandy Hook Elementary in 2012. "There's a battle between apathy and empathy right now," d'Offay said. "What the projects have been trying to do so far is create these pockets of potential to feel compassion. Right now I'm really feeling the need to show how contagious empathy is, because apathy is just as contagious and it's really scary. "This whole year's theme is feeling like your voice is too little to make a difference." The duo came up with a storyline surrounding the concept of fictional 8-year-old "Bobby" and his friend who sometimes acts out — a "potential shooter" — and "Bobby's" coming to understand the ways compassion and understanding can affect others, while learning to deal with his own problems. 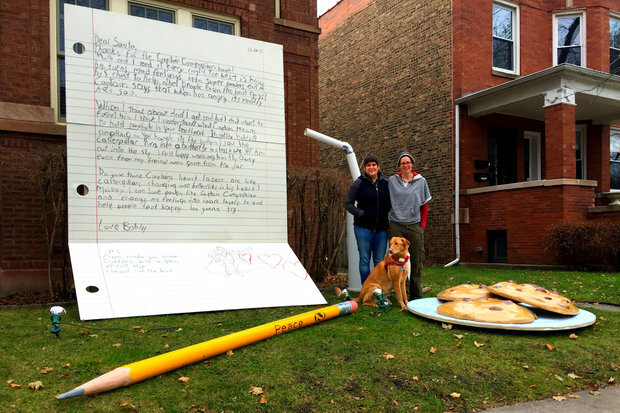 Each new installment adds to a piece of the story and overall spirit of kindness, as well as new homemade props like 2015's mega-sized glass of milk and cookies in addition to the usual 12-foot letter and 9-foot pencil or pen. 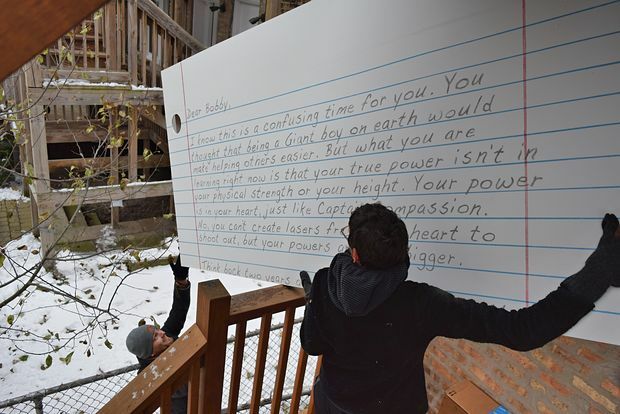 Gilmore installed the giant letter and pencil at her Chicago home Friday and will later be adding a smaller letter and "trinket box" for Santa. In Austin, d'Offay constructed her letter, a giant pen and oversized coffee mug. This year, "Giant Letters" were installed in the original Edgewater location and in Austin, Texas, where d'Offay lives part-time. The two-part project includes four letters: a giant letter and "tiny" letter in each city that represents "a person with a tiny voice who's trying to get through, and they're struggling." Chicago's letters show a conversation between Santa and Bobby, who in the story lives on a planet much larger than Earth, and in Austin the letters present correspondence between Santa and Bobby's mother. "Santa just gives him this pep talk that says, 'Your powers aren't in your size ... your power is in your heart," d'Offay said. D'Offay said the project is never meant to be political, but felt the concepts of individuals feeling like they could make a difference in the world and inspire others to do so felt especially pertinent. For the "Giant Letter" creators, the visual arts have always been an effective tool for "speaking without speaking." Places like Edgewater and her other neighborhood in Austin were the perfect fit because while residents there had a mix of diverse backgrounds and viewpoints, most showed a willingness to have an open heart and mind, she said. "I think the message is just kind of geared to people are a little too busy to notice suffering, and I think in both of these neighborhoods there are some of these people — and they are the ones who are really moved," d'Offay said. "They can drive by and see it and have this experience." I am good. Im fustrated but safe here on Circlo. I keep practising on how to travel to Circlo because somebody here really needs me. but i lose my powers here because i"m to small. I can feel somebody here needs help but nobody can see or hear me no matter how loud I scream so i don’t know where to find them. Even on Earth i get fustrated becase I cant here the humans and they cant hear me. I scream so loud to get there attension but it feels like my voice doesn't' even work. I feel like my powers are useless. but I still feel people needing help and i don't know what to do. I know this is a confusing time for you. You thought that being a Giant boy on earth would make helping others easier. But what you are learning right now is that your true power isn't in your physical strength or your height. Your power is in your heart, just like Captain Compassion. No, you can't create lasers from your heart to shoot out, but your powers are even bigger. Think back two years ago when you shared with me, that dream you had about your ants. They were crying for you to help them, but you couldn't hear what they were saying. THIS was the moment your powers really began. Remember the sensation in your chest when you woke up? You said that your heart felt like it was flowing out like a river and that without even thinking about it, you picked up your ant farm and saw something you hadn't noticed before, that there was a crack in the glass and your ants' water had been evaporating. They were dying of thirst. These little actions of care have a much greater impact than you realize.Your powers are that you don't need to hear words to know people are suffering, just keep listening with your heart and let it lead you to those who need your help. P.S I know your mom is worried about you since she learned that you've been traveling to other worlds, but she is also learning how important your ability to help others is. We all are. Keep it up! Your heart is a power too strong not to use. Each year the project takes about 3-4 weeks from start to finish, but with traveling between two cities and writing four letters among three creative minds, the installation was pushed back a week further than usual. It stays up until d'Offay's birthday, January 11. Though the expanded work this year made for repeated trips to Home Depot and figuring out ways to make giantic household items, d'Offay said it was the emotional letter-writing that is the hardest part. This year especially, broadening Bobby's backstory was important to the creators, she said. In 2012, the first year of the installment, Bobby received a letter from Santa explaining that yes, his friend did make the naughty list that year, but it was only because he stopped believing in himself. But, Santa said, there was always hope for people. The following year, Bobby wrote Santa back, upset because his friend was now not only sick, but was having a hard time at home and didn't have many other friends. Bobby talked about wanting to be there for his friend, but had trouble getting him to open up about his feelings. In 2014, Santa explained to Bobby that when he saw people picking on his friend, he should remember that bullies are the reflection of a tortured soul that needs nurturing. Last year, "Bobby" responded first by thanking Santa for a new book, "Captain Compassion," about a man whose superpowers are based in having compassion for others. By reading it, he said he learned that when people seem angry, they are probably really sad. After DNAinfo first reported the story, d'Offay and Gilmore received international attention, as well as made meaningful connections with people next door and across the city. Art has the ability to transcend topics that normally divide people, d'Offay said. "What's happening right now in the world is there are so many painful events, there are so many small voices that everybody's just kind of following along in this apathy and it's becoming a trend," d'Offay said. "It's the wrong trend. ...There are a lot of people trying to promote compassion, and I think it's a really important time to do that."